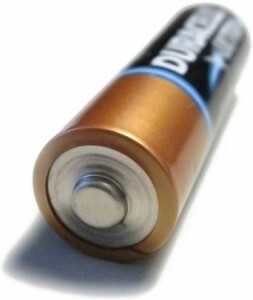 Duracell manufactures alkaline batteries in many common sizes, such as AAA, AA, C, D, and 9V. Lesser used sizes such as AAAA (primarily for pagers, penlights, and bloodglucose meters) and J size batteries (for hospital devices) are also manufactured along with a range of “button” batteries using zinc-air, silver-oxide and lithium chemistries, used in calculators, watches, hearing aids, and other small (mostly medical related) devices. Duracell entered into a brand licensing agreement with flash memory manufacturer Dane-Elec in 2008 for a line of products including memory cards, hard drives and USB flash drives with the Duracell brand mark and in the brand’s trademark “copper top” coloring.